When I saw this DIY on Deuce Cities Henhouse, I felt inspired to add a similar plant hanger to our kitchen window once everything was painted white. My plant hanger ended up being a lazy woman's version (It's Layzay Macrame! ), with only two knots and no beads, but I think it's pretty cool. Two eight foot pieces of accessory cord, rope, twine, etc. A nifty ceramic pot - mine is from the goodwill! 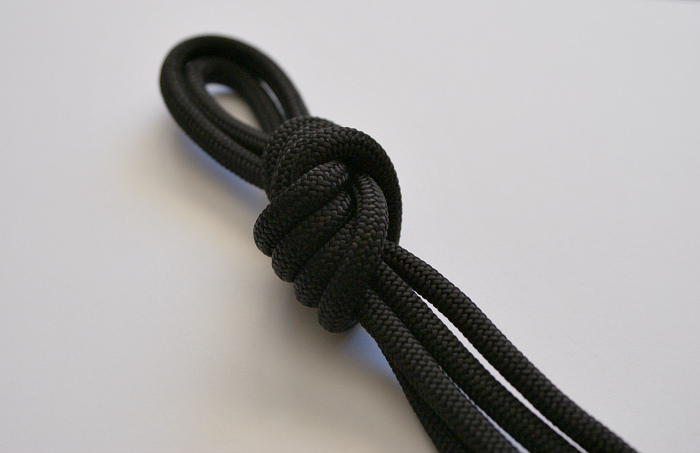 Step 1 - Put the two pieces of cord together and then tie an overhand knot in the middle, leaving a loop at the top for your hook. This will make four strands. Step 2- Bunch the four strands together at what will be the bottom and tie another overhand knot. Step 3 - Trim up the end pieces. You may want to melt the ends using a match to keep them from fraying. I recommend doing this outside because...hello fire...and it can be smelly. Step 4 - Screw a hook into the ceiling of a well lit area, like a kitchen window! Step 5 - Add your nifty pot and plant. I love this plant hanger because it's kinda chic and is also a small nod to our love for rock climbing. The material is accessory cord that's frequently used for various outdoorsy things. We've been on a hiatus for the past couple of years, but Jesse and I used to climb like mad and take weekend road trips all over the place. Jesse recently started building a training wall in the basement, so I'm hoping we'll be back to our sport / hobby soon..This time with B in tow! This is so simple and beautiful! Pinned! Thanks so much for linking up at Thursday STYLE! I love this! That pot is so pretty! Thanks for this! 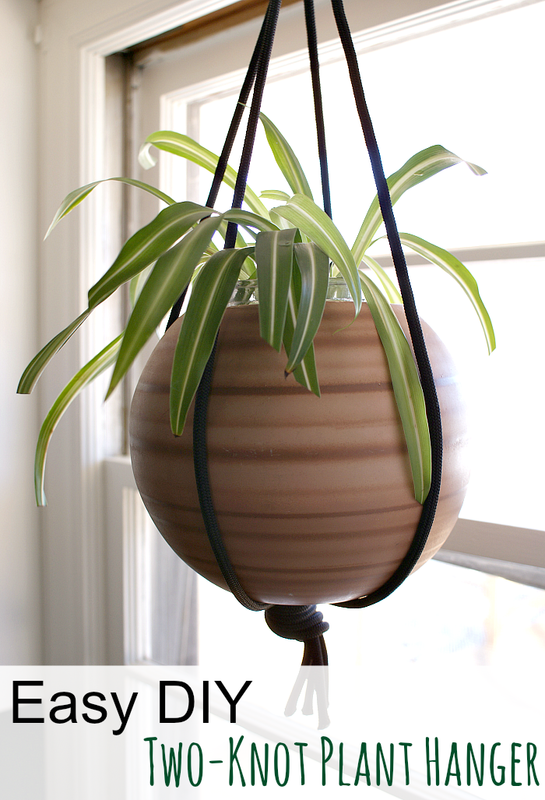 I've been looking for a hanging plant pot holder for a month, and none to be found anywhere. Just decide to check out DIY options, and yours is the best! So simple, and materials already on-hand! I just used a couple of 8' lengths of clothesline cord. That's so great to hear! Thanks for sharing!